These resources are starting points. They represent a fraction of the research I’ve read and that I talk about when delivering a talk at a conference or school. If you’re interested in that, please see my Speaking area here. Why should schools care about stress? Three reasons: first, because they are and should be caring places. Second, because stress affects performance and results. And third, because stress management is a life skill and schools have a duty to teach it. If you represent a school, easily the best way to educate your students about wellbeing and stress would be to buy a licence for Stress Well for Schools: it’s a complete and ready-to-use set of materials designed for you. MY CLASSROOM RESOURCES: Brain Sticks and Stress Well for Schools provide a comprehensive way to teach wellbeing management to people of all ages. 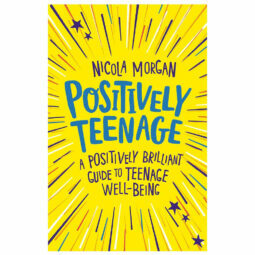 Positively Teenage is based around eight principles which I put together some years ago as great ways to make our brains work well. FLOURISH is a useful way to remember them. If you’d like to download a FLOURISH poster or postcard for printing, there are some on the Positively Teenage page. There are also free teaching notes on that Positively Teenage page. I’m creating 52 Ways to Well-Being. To find the ones I’ve done so far, see here. They are suitable for all ages. 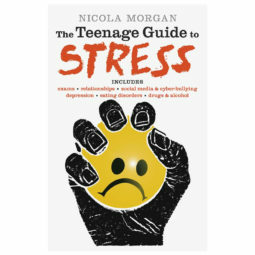 Of course, The Teenage Guide to Stress is a comprehensive guide to … teenage stress. It’s widely used in schools and is really appreciated by teenagers. Personally, I’m not. I’m quite drained by people seeming to think it’s the answer to everyone’s stress. Undoubtedly it helps some people – even many people – but it doesn’t help everyone. Ever the idea makes me stressed! Keep it away from me but do try it yourself. If you do try it, be taught it properly, by someone who has done more than attend an 8-session course… And don’t worry if it doesn’t work for you. Someone who suffers a diagnosed or severe anxiety disorder or a mental illness should only do mindfulness under the guidance of a clinical psychologist, in my view. Don’t Sweat the Small Stuff by Dale Carnegie is a bit fluffy for my liking but everyone’s different! I hope you have found this selection of resources useful. Remember they are only starting points and there is much more in the rest of my website, books and classroom resources. Do ask me to come and speak to your audience – teenagers or adults. Adults need this just as much as young people and if we’re struggling with stress ourselves it’s much harder to care for other people. See the Speaking section of my website.